Millermeade Farms carefully selects our animal for our breeding program. When we are aware that an animal is being selected as a breeder, we will help our customers identify animals that we believe are ideal for a breeding program. Come from a mother who nurses her babies well without complications or baby growth delays. 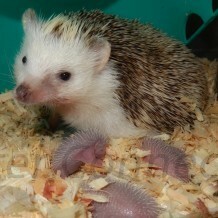 Come from a large litter and from a male who has a good reproduction history. Have nice confirmation and balanced body type.